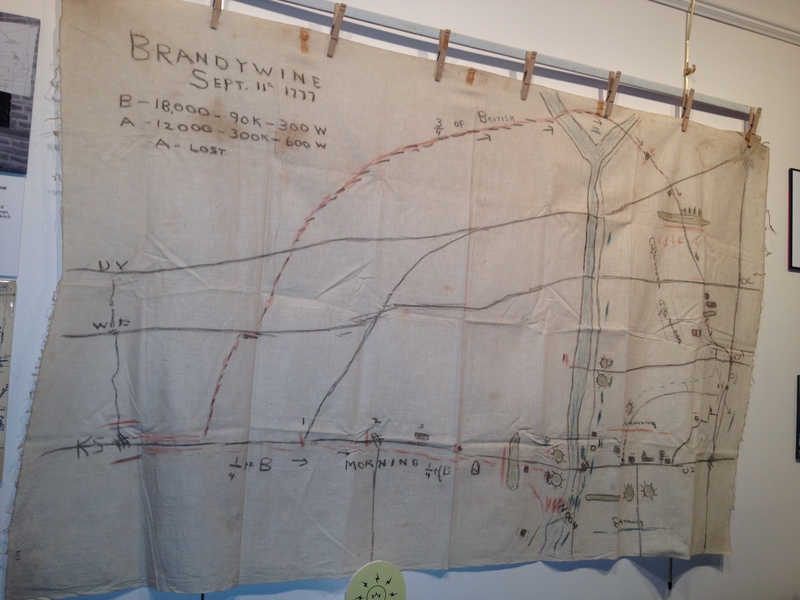 A sheet used by the late historian Chris Sanderson to illustrate troop movement during the Battle of the Brandywine is part of the exhibit at the Chadds Ford Historical Society. CHADDS FORD — From a “traveling bedsheet” to an interactive computer program: That circuitous route for educating the public about the Battle of the Brandywine serves as a focal point for a new exhibit at the Chadds Ford Historical Society. Titled “Brandywine Battlefield: The Road to Recognition,” the display is a collaboration between the historical society and the Christian C. Sanderson Museum, another of the region’s historic treasures. It commemorates the 235th anniversary of the Revolutionary War’s largest land conflict, which marked the first time the Stars and Stripes were flown in battle. The exhibit has generated excitement from the staff and volunteers at both institutions with good reason: Not only does it appeal to history buffs, but it also show residents in townships that include Chadds Ford, Kennett, Pocopson, Pennsbury, Newlin, Birmingham and East Marlborough just how close some of the more than 30,000 soldiers came to their backyards. Among his numerous talents and obsessions, Sanderson, who died in 1966, was a lifelong advocate for preserving the battlefield, and he often lectured on its history, using a sheet on which he had sketched an outline of troop movements. Sanderson’s makeshift, portable map is part of the exhibit, but so is an interactive computer display that shows the movement of the Hessian, British, and American troops in real time on Sept 11, 1777. The display even shows how Continental spies tried in vain to warn Gen. George Washington that a force led by Gen. Charles Cornwallis was marching through East Marlborough, Pocopson, and Newlin Townships in search of an unguarded ford. Once he found access at both Trimble’s Ford and Jeffries Ford, Cornwallis caught the Americans by surprise, eventually securing a British victory. 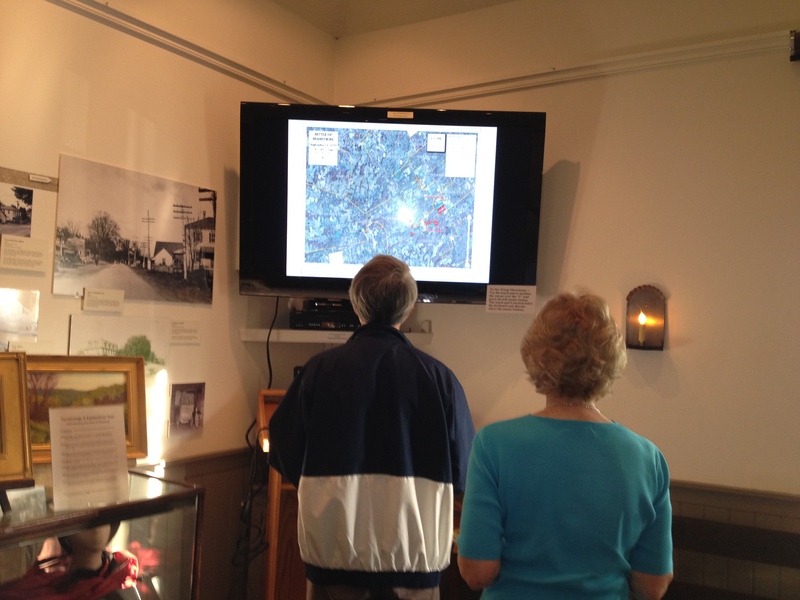 Visitors watch the movements of troops during the Battle of the Brandywine in real time. The exhibit also traces efforts to preserve the battlefield site, an endeavor that has become its own battle as government funds have dwindled in recent years. After being threatened by land development, the battlefield became a National Historic Landmark in 1961, and the Pennsylvania Historical and Museum Commission named it the first Commonwealth Treasure in 1997. But due to state budget cutbacks, the site was virtually shuttered in the summer of 2009 when the Pennsylvania Historical and Museum Commission eliminated all funding for the 52-acre park except for a single maintenance worker. Friends of Brandywine Battlefield, a volunteer group, came to the rescue. Since then, the nonprofit has been fighting to preserve the battlefield’s legacy by raising administrative funds and recruiting volunteers to conduct tours. The exhibit, which runs through Dec. 1, can be viewed at the Chadds Ford Historical Society’s Barn Visitors’ Center, 1736 N. Creek Rd., Chadds Ford. 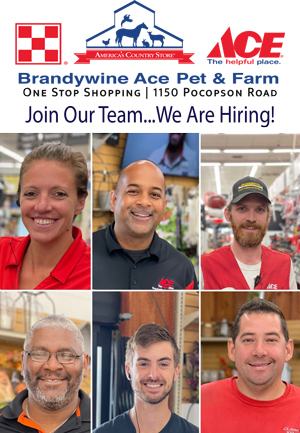 It is open from 9 a.m. to 2 p.m. Monday through Friday; however, from Memorial Day through Labor Day, the center will be open from 1 to 5 p.m. on Saturdays and Sundays. For more information, visit www.chaddsfordhistory.org.